With the rapidly warming weather, several are asking “When will crabgrass germinate?” The reason this is so important is because preemergence herbicides used for the control of crabgrass must be applied prior to emergence. The timing of this application is critical for effective control of crabgrass and other summer annual grassy weeds. Crabgrass is invasive and difficult to control weed grass. Don’t be one of those lawn owners who “wonders why they have crabgrass in summer even though they put down crabgrass preventer in spring”. Once your lawn is filled with crabgrass, it is extremely expensive and difficult to kill. Having a thick lawn is the critical first step to crabgrass prevention. Well-aerated, nutrient rich soils will help your lawn grow thick while reducing thatch, and weed population. At GreenLawn by Design we have been perfecting the control of crabgrass. Our weed preventive program gets rid of crabgrass in the spring and controls it throughout the summer. Below are several different ways to determine when crabgrass will germinate, and how to control it. When should I apply my preemergence herbicide? Crabgrass begins to germinate or grow when the soil temperature reaches 55 degrees Fahrenheit. The flowering of landscape plants can be used as a good estimate of when crabgrass might be germinating. Many are aware that forsythia is traditionally considered a good plant to indicate that crabgrass will soon start germinating. Forsythia will be in full bloom prior to crabgrass germination and forsythia flowers will wither near crabgrass germination. Most think that crabgrass germinates when forsythia blooms, but this is false. Instead, we use forsythia blooms as an encouragement to hurry up and get the preemergence application made before crabgrass begins to germinate. For more precise application timing based on Growing Degree Days (GDD), visit Purdue University’s GDD Tracker. Enter your zip code and select “Crabgrass Pre.” The optimum time for crabgrass prevention is now. This helpful website is available to help you monitor growing degree days for timing herbicide and plant growth regulator applications. Homeowners should target the early or optimum timings when using. On the GDD tracker for crabgrass below, it shows that now is the optimum time to apply preemergent for the Carmel, Indiana area. Optimum time to apply preemergent for the Carmel, Indiana area is now! How do I control crabgrass in spring seeded turf? The best approach to controlling crabgrass is to use a preemergence herbicide. Additionally, these applications help to prevent the emergence of some broadleaf weeds. Most preemergence herbicides work to kill weeds by preventing cell division causing death to weed seedlings shortly after they germinate. Preemergence herbicides work to prevent the emergence of turfgrass seeds as well as weed seeds, so do not reseed areas treated with a preemergence herbicide this spring or do not apply a preemergence herbicide if you plan on seeding. Since establishing turf in the spring is not as optimal as establishing turf in the late summer, you might likely have better long term results if you wait to seed in the fall as opposed to seeding this spring. This will only be an option for those patient enough to wait until they get their lawn back into shape. How do you control crabgrass in lawns this spring when a preemergent was not applied? Use a postemergence herbicide to control crabgrass in late May and June when the grass has developed a root system. This application would also prevent future crabgrass germination through the rest of the summer in newly seeded areas. Now’s the time for crabgrass prevention! 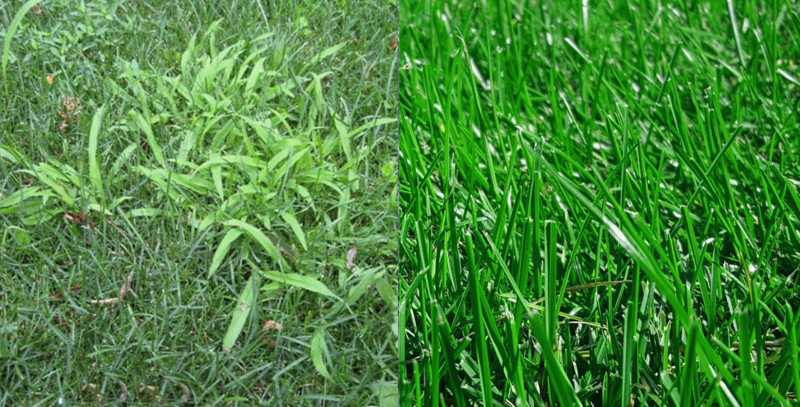 It’s been said about crabgrass: “One year’s seeding makes seven years weeding”. Control is essential and now is the time to plan for pre-emergent prevention. If you’re too busy or just don’t have the “green thumb, hire the local experts at GreenLawn by Design. Our weed preventive program gets rid of crabgrass in the spring and controls it throughout the summer. For more information on crabgrass germination and preemergence please visit Purdue Turf Tips or contact the experts at GreenLawn by Design 317-804-8088!